The album opens with James awakened from a post-gig reverie by motel staff impatient to extricate him from his room and clean it. James complains in a glorious story song, ‘Do Not Disturb’, an understand low key rumba punctuated with a few choice hamonica blasts. James and the band are really only just warming up. But, wait a minute, what’s this? James puts his harps down? Already? It’s only the second song. Guitarist Joel Foy and the rhythm section jump into an exquisitely-timed shuffle, James declares he’s leaving in the morning and has Decatur, AL on his mind, exhorting the string-zinger to greater and greater heights on the instumental breaks, until Foy finally rocks out in impressive style and the song shudders to a halt. Alright – harp. Here it is, next up, you said you wanted some. The band up the tempo and pour it on: it is indeed a ‘Wake Up Call’. Oh good Lord almighty, listen to that tone. More excellent work from Mr Foy, with James squalling and howling away on his diatonic. A world-weary full band ‘Rags To Riches’ with some romping sax by New Orleans legend Lee Allen, plus keyboard stalwart Gene Taylor on rippling barrelhouse piano. No harp, but there’s more about James than just harp and here (as bass player Jeff Turmes once reminded me) it’s all about the lyrics. Track 5: the aforementioned ‘Stranger Blues’ (some great accompaniment from drummer Steve Mugalian), and then the band shift a gear into ‘Icepick’s Advice’, James motormouthing about his baby and how not to burn your candle at both ends. Los Lobos‘ David Hidalgo drives the rap along with some discreet Tex-Mex accordion before James’ yelping harp coda. Then we find out that James is the king of his ‘Motel Room’, and it’s a place we find him throughout his career in song. The “TV is beaming its eerie glow, but it stays on ‘silent’ until I go” – this one’s all about the lyrics too. The solo just rasps. ‘Swampnight’ hits that.. well.. swampy groove, and doesn’t let go. Joel Foy turns up the reverb a notch, and if there’s a dancefloor nearby, you’re hittin’ it. ‘Icepick’s Confession’ swings in with all the tenacity of an ‘On The Road Again’, James declaimin’ the mitigating circumstances of a sticky situation he’s got himself in and as the prosecutin’ attorney gives him the third degree, he pops out a couple of harp solos just to make sure the court is paying attention. The album’s crowning highlight, again a full band affair, is the burning slowie ‘Phonebill Blues’: James’ baby has a new love interest and it’s sheer agony for our hero. 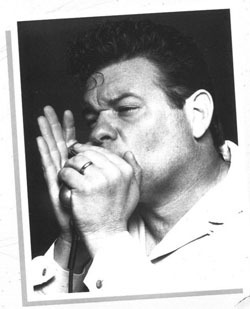 Joel Foy fires out some choice Lowell Fulson inspired licks. The song’s mid-section drops right back to naught but a snaky lead guitar line and cymbals.. it’s midnight on the coast, alright. But wait a minute, these boys are getting angry. The horn section really starts to blow. You’re on the edge of your seat. Foy pours it on, and on. James wails, cuts back in, he’s in no way happy, and in a shattering climax, tells his baby to send the phonebill he just rang up calling her to her brand new man. Relief and joy: ‘Mad About Something‘ – it’s a low-down West Coast shuffle that springs along with some nifty interlaced guitar lines and James neatly fits his mighty harp blasts in and around the vocal lines until letting fly towards the end of the song, which has one of those knock-down dad-blame god-almighty take-it-to-the-bank perfect false endings that goes on and on until we all collapse in a heap, sated. The album should end there.. but James just has time for a rock and roll wig-out called ‘I’m Gone’.. and he is, fading out with some truly unhinged blues riffing from Joel Foy. The sleeve notes tell us the album was recorded “..into lots of air, in a big room with old tube mics, tube amps, into special pre-amps, onto “old style” two inch tape, on 16 track analog machines. Finally – for a big fat, warm, real sound – no Dolby, no enhancement, no gimmicks, no gags.” And it sounds great, no doubt. It sounds like.. just how you’d like YOUR band’s album to sound. Hell, you’ll want to be IN this band.. but it’s a few years too late perhaps for any of us to fulfil that fantasy. Anyone with the remotest interest in the blues should be just plain overjoyed with this record. It still gives me thrills nearly 20 years after it was released. Oh yes! 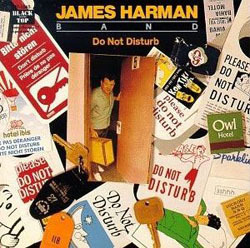 James Harman, he’s the business. You’re right about the lyrics, he’s got a real knack for a quirky line and creating an atmospheric scene – a bit like a film. We do a version of his “Helsinki Laundromat Blues”, which is possibly the best song I know about waking up in a launderette with a strange girl……. and it includes advice on selecting a washing machine and the proper use of fabric softener. What more do you want? As well as being a briliant harp player with bags of tone – I think he’s a fantastic singer too. This time he didn’t scare me, though he reeked of mortal sin.. Genius, that is. And the subsequent verse describing the horses.. I’m not going to print that here, it deserves to be heard sung. Laugh out loud funny.